...And Justice For All marked a turning point for Metallica — one that would launch the cult band into the mainstream. 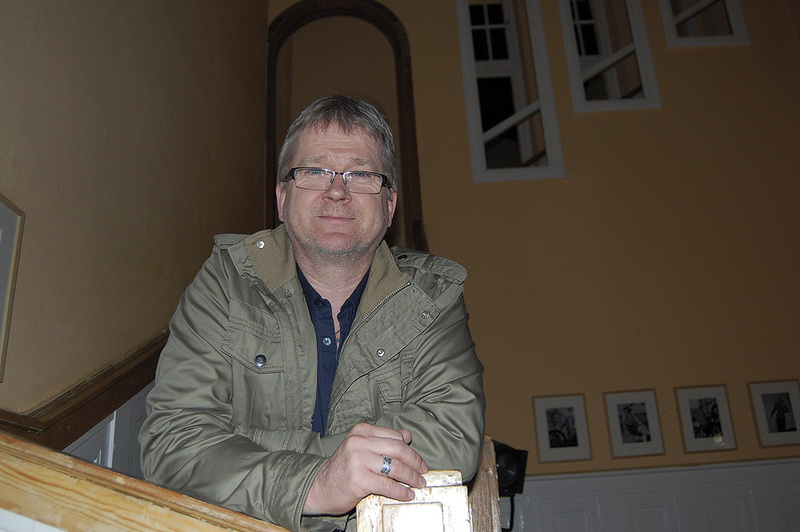 The man at the controls, Flemming Rasmussen, tells us how it happened. In January 1988, Metallica regrouped following the release of three increasingly successful studio albums and the death, some 15 months earlier, of bass player Cliff Burton, who had been crushed beneath the band's tour bus when it crashed in Sweden. Bassist Jason Newsted joined singer/rhythm guitarist James Hetfield, lead guitarist Kirk Hammett and drummer Lars Ulrich to begin work on ...And Justice For All. 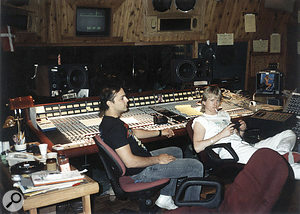 Recorded over the course of four‑and‑a‑half months in LA's One On One Studios, this would turn out to be the breakthrough project for the Californian thrash-metal virtuosos, reaching number six on the Billboard 200 en route to eventually being certified eight times platinum by the RIAA. In what has since been named one of the 10 biggest upsets in Grammy history by Entertainment Weekly, the musically complex progressive‑metal album lost the 'Best Hard Rock/Metal Performance' award to Jethro Tull's Crest Of A Knave. Despite its popularity, the record also courted controversy among Metallica's growing legion of fans. Many listeners were critical of what they perceived as the album's overly dry and clinical sound; one which, for reasons that will be explained a little later, was largely devoid of Newsted's bass. And for another, a lot of diehard fans weren't happy that the band joined the commercial mainstream and courted the likes of MTV by shooting their first music video. 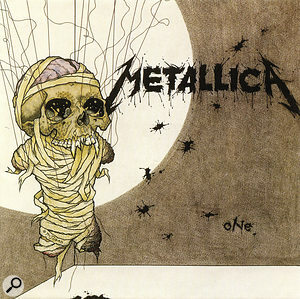 Said video accompanied 'One', the fourth single off the album and Metallica's first record to crack the Top 40 in the US, climbing to 35 on the Billboard Hot 100. With a running time of just under seven‑and‑a‑half minutes, its lyrics were inspired by Dalton Trumbo's provocative anti‑war novel Johnny Got His Gun, in which a WWI soldier lies helpless in a hospital bed, trapped inside what's left of his body having lost his eyes, ears, nose, mouth, arms and legs in a mortar shell explosion. Despite struggling to get radio airplay, 'One' became Metallica's first hit single, and remains a staple of their live performances. Born in Denmark's capital city on New Year's Day 1958, Rasmussen began his career there as an assistant at the Rosenberg Studios facility run by producer/engineer Freddy Hansson. In 1976, Hansson founded the state‑of‑the‑art Sweet Silence, and after having been installed as his sidekick, Rasmussen progressed from teaboy to engineer, recording the 1981 album Difficult To Cure by Ritchie Blackmore's Rainbow. The previous year, he'd become a co‑owner of the studio that he would eventually take over in 1999, and it was in early 1984 that Rasmussen first hooked up with Metallica. Impressed by Rasmussen's work with Rainbow, the band approached him about collaborating on Ride The Lightning and he duly obliged, engineering and co‑producing this highly progressive and influential album. 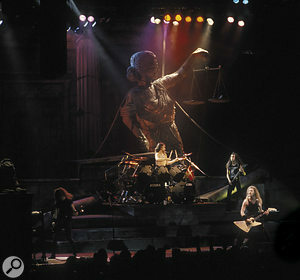 After Master Of Puppets was also recorded and mixed at Sweet Silence during the last few months of 1985 and released the following March to even greater acclaim, Metallica reconvened at LA's A&M and Conway Studios in the summer of 1987 to lay down the first tracks to feature Jason Newsted on bass. These were issued on the self‑produced $5.98 EP: Garage Days Re‑Revisited, comprising covers of five numbers by British new-wave metal outfits. "At that point, they'd already been in the studio for several weeks and had done virtually nothing,” Rasmussen continues. "All they had done was check the sounds, switch some guitar amps and record a cover tune — we'd always start a Metallica session with a couple of cover tunes for me to fine‑tune the sound while they got into the studio vibe. It would also provide them with material for 'B' sides. In this case, however, they were definitely not happy with the way they sounded. The in‑house engineer at One On One was Toby 'Rage' Wright, who set up and maintained the equipment while Flemming Rasmussen kept his fingers on the faders. 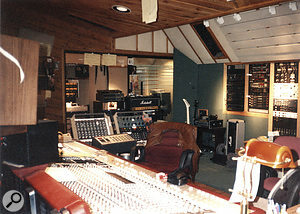 At that time, One On One was equipped with an E‑Series 48‑channel SSL 4000, two 24‑track Studer tape machines and Tannoy monitors, which the producer bypassed in favour of his own JBL 4311s. Having recorded Metallica's two previous albums with the Trident A‑Range console at Sweet Silence, Rasmussen was no great fan of the E‑Series, and so he used One On One's old Neve desk for all of the inputs, retaining the SSL as just a monitor console. 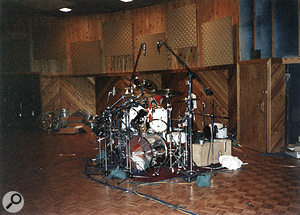 Whereas Jason Newsted played his five‑string Wal on the left side of the main room, with his amp in a rear booth, Lars Ulrich's drum kit was on the right side of the live area, facing the control-room window, for recording on to an entire 24‑track reel. Accordingly, there were five Shure SM57s on the toms, a couple more 57s above and below the snare, Ulrich's recently acquired contact mics underneath each of the cymbals, recorded in a stereo spread, Electro‑Voice RE20s on both bass drums, and about half a dozen room mics. "The guys were in a layering mode, aiming for perfection, so we'd lay down a guide track for the tempos, as well as a click track for Lars to play to, and then we'd do all of the guitar parts as a dub,” Rasmussen recalls. 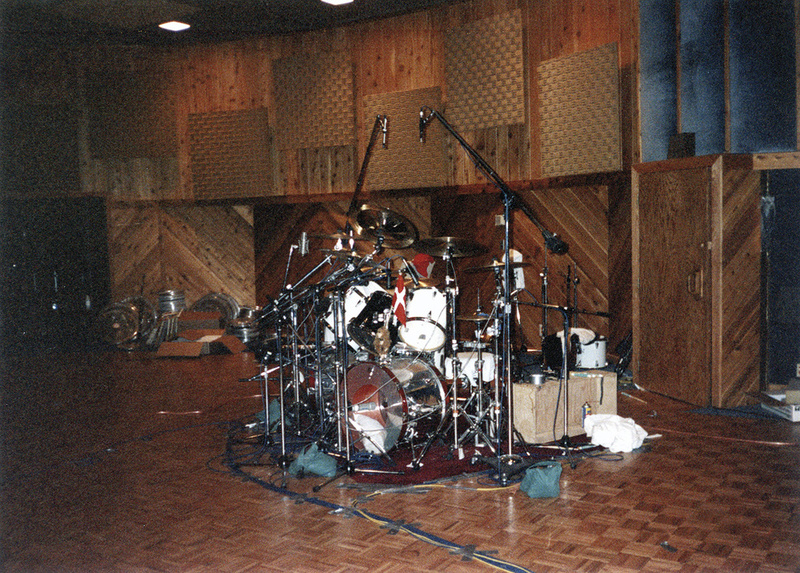 "Kirk and James stood near Jason, on the left side of the main room, and [their ESPs] were each recorded with a Shure SM7 placed at a 45‑degree angle close to the cone of the best‑sounding speaker in the [Marshall] cabinet, as well as a Neuman U87 right next to it. Then, for a room mic, I'd use an AKG tube mic which was a replica of the old C12 tube, placed at a 45‑degree angle about three to four feet away from the corner of the cabinet, while for ambience I used some B&K 4006 omnis. That meant a total of four mics on each cabinet, and we probably used two cabinets for everything, with me mixing and matching them when we did the recordings. The basic rhythm guitar was always recorded on two tracks — one with the cabinet [and one with the ambient mics] — so I'd mix the SM7 and U87 right away, and then for the rest of the guitars I'd mix everything into a mono track and double it. "Don't ask me what happened, because I wasn't there when they mixed it, but it certainly sounded a lot fatter when we recorded it,” Rasmussen insists. "The ambience was there, as was all of the fatness in the bass track. I treated it a lot to get a sound that was probably a cross between Ride The Lightning and Master Of Puppets, because what made the drums sound so grand on those albums were the room mics that we used in the studio in Copenhagen. We put Lars in a huge, warehouse‑sized room, I had mics in the corners, and that was pretty high in the mix. But when Steve Thompson and Mike Barbiero mixed Justice I don't think they used the room mics from One On One at all. I think they just used the close mics. But again, I can't be sure because I wasn't there. 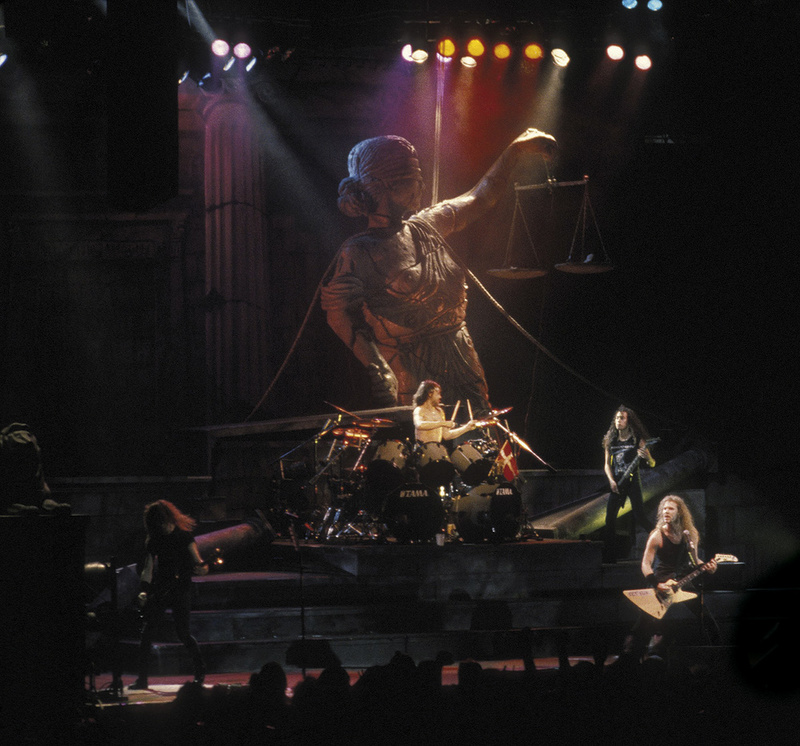 Despite all of this audio‑related controversy, what few dispute are the musical merits of ...And Justice For All, and more specifically, those of 'One', which would eventually gain the band a Grammy in 1990, for Best Metal Performance. Military sound effects, unconventional time signatures and harmony guitars frame the song's disturbing theme and haunting lead vocal, underscored by both guitarists' rapid‑fire coordination with Lars Ulrich's machine‑gun drum breaks. Kirk Hammet's initially gentle playing conrasts with his blistering, highly acclaimed solo as the pace accelerates, before he and James Hetfield duet towards the end. "'One' was played entirely to a click track, and it took us probably half a day to figure out the varying tempos,” Flemming Rasmussen now recalls. "The chorus was actually a lot quicker than the verses, so I had to manually punch in and out a Linn Drum click track on the 24‑track to make sure we got that tempo transition over the bridge, before it then fell back to the original tempo for the verses. Kirk and James played their guide parts together with the drums. Then we took the tempo from that and, once we had laid down the click track, Lars did a quick run‑through and the guitarists played their parts to that. From there, we started building the track, section by section. "The whole thing with that specific song — as well as several of the other songs — was their desire for a technical perfection that would have been easy in these days of computer editing but which, back then, we had to achieve manually. Lars's playing had to be extremely tight, and we did 20‑ to 30‑second segments with me punching in and out over 18 drum tracks. When we got a good bit, we'd sit and listen to it a couple of times to make sure it was cool, and if, say, one hi‑hat hit was a little late, I'd chop out a tiny bit of tape with a razor to make it exactly right. That was a long and tiring process, and whereas it would now take about half a day to complete one of those drum tracks, back then it took us a minimum of three to four days. 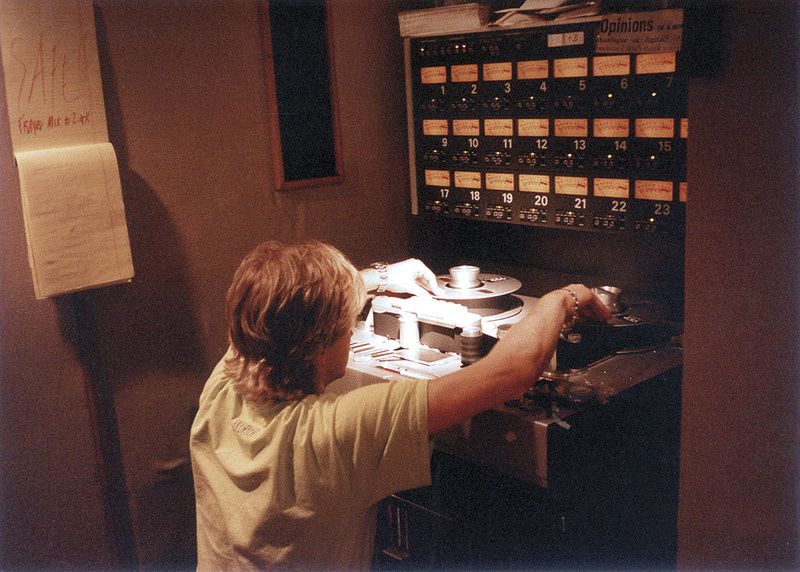 For each song I had a big envelope full of bits of two‑inch tape that I had chopped out, and I remember joking to Lars that they should hold a competition for the fans, enabling them to win lost bits from his drum tracks... He didn't find that at all amusing. However, for that time, what we ended up with was almost computer‑accurate, even though it was just him playing. As was that of the guitarists, whose parts were added next. "The song starts out with clean guitars, and for the chorus there were a couple of James Hetfield rhythm guitars that helped build it up,” Rasmussen says. "Then, when we got to the machine‑gun part with the double bass drums, we began layering rhythm guitar tracks. By the end of the song there were six or eight rhythm guitars, played by James on different amps with different sounds on top of each other. However, he was so tight that this just sounded like one big wall of guitars. And if anything needed to be punched in, he'd just go back and pick it up right away. He was extremely fast and extremely accurate: in my opinion, probably the best rhythm guitar player in the world. It's unbelievable what that guy can do. Next came the bass, which Jason Newsted played to the rhythm guitars. "With metal, it's really important to record the rhythm guitars and lead before the bass goes down,” Rasmussen asserts. "If the guitars had to play to his interpretation of the riff, the end result would be crap. So, the rhythm guitars rule in metal — that's just the way it is. At around the same time, we also did the vocals. You know, when Lars needed to go away for a week we'd spend that time recording James. Then Lars would come back and James would piss off — that's how it went. So, when Lars was away we set up the vocals with the SM7 and James did his thing. On 'One', the last elements to be added were the sound effects, including artillery fire and flying helicopters, but these weren't handled by Rasmussen since they were left to the mix. Indeed, as someone who believes in working closely with artists and trying to achieve things from their perspective, Rasmussen states that with Metallica he felt like the fifth member of the band. "We were together 15 or 16 hours each day, so that was bound to happen,” he remarks. "I would identify with the emotions they were trying to convey on the record, as well as their motivations for making that music — after all, it was their album, not my album.